Concentrations of atmospheric greenhouse gases continue to rise at record rates, and climate damage is intensifying across the planet. In 2017, the CO2 concentration in the atmosphere reached a record level and was 0.5% higher than a year earlier but by as much as 41% higher than in 1990 according to the latest report by the World Meteorological Agency (WMO). 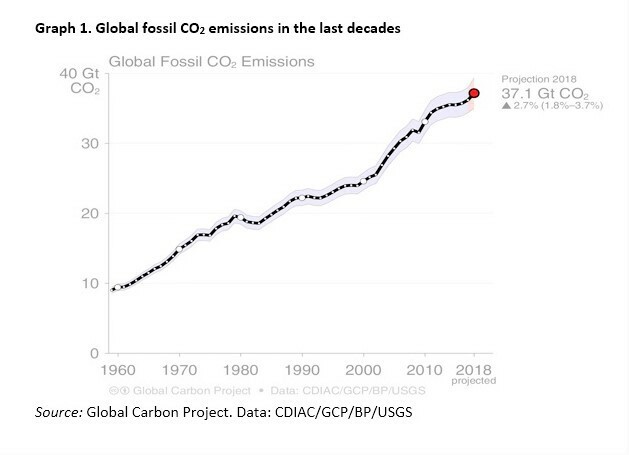 What is more, the Global Carbon Project estimates show that final fossil emissions this year will be higher again. This issue, alongside many others related to the climate change, was discussed in depth between December 3rd and 15th in the Polish city of Katowice, where COP24, or the United Nation’s (UN) Conference of Parties, took place. The ‘Paris Agreement rulebook,’ which was mandated in 2015 to be finalised by the end of COP24, has eventually been signed almost 30 hours later than initially planned. The package includes guidelines that will operationalise the climate transparency framework. The framework covers a multitude of issues such as how countries will measure, report on, and verify their emissions-cutting efforts or what rules should apply to voluntary market mechanisms such as carbon trading. As all these much needed actions require sufficient amount of funding to be implemented, ‘climate money’ was one of the main themes of the political debate at the Katowice summit. Climate change financing has for the first time played an important role — albeit for different reasons — at the infamous Copenhagen COP15 in 2009. When it became clear that no real agreement would be signed, an ambitious financing proposal was presented instead. 18 developed countries were supposed to help those most vulnerable and, starting from 2020, mobilise USD 100 billion a year to support the mitigation efforts of developing countries. Alas, the Green Climate Fund, which was supposed to be a key instrument for this, became operational only in 2014. Just before COP24, the UN confirmed that developed countries have managed to secure only 70% of the pledged funding thus far. At least another USD 30 billion have to be secured prior to COP25 in Chile. At COP24, green bonds, or bond earmarked to be used for climate-related and environmental projects, were discussed particularly fervently. According to the Standard & Poor’s Financial Services LLC (S&P), the green bond market grew from USD 1.5 billion in 2014 to USD 27 billion in 2017. This pace of changes resulted not only from banks’ policies but also from preferences of multinational companies like Apple. For example, in June 2017, following the United States Administration’s withdrawal from the agreement reached at COP21 in Paris, Apple issued its second green bond of USD 1 billion — the largest bond issued by any American company until now. Going green has become something to boast about. Banks present in Katowice were talking about their plans to procure electric cars to the banks’ fleets and sharing experiences on becoming ‘paper-less’ or reducing the consumption of electricity (both for heating and cooling). Others, like the Polish branch of BNP Paribas, were proudly talking about their new headquarters that have BREEAM environmental certificates granted to buildings which can significantly contribute to the green transition. New energy technologies have to be accompanied by investments in energy efficiency. The same can be said about adaptation projects to climate change, such as investments in buildings resilient to difficult climatic conditions, which were heavily discussed for example in the COP24 Pacific and Koronivia Pavilion. In another project presented in the ENERGIES2050 Pavilion, EuroPACE (implemented by a consortium coordinated by CASE thanks to funding from the European Union’s Horizon 2020 programme), an innovative financial platform for home retrofits to improve existing buildings with energy efficiency equipment is being developed. The platform is fully financed through private capital and repaid in a form of on-tax financing scheme, which improves its sustainability. Also during the summit, the ‘2018 Global Investor Statement to Governments on Climate Change’ was signed by 415 investors, with USD 32 trillion in assets-under-management. In the statement, the investors called on governments around the world to foster action to tackle climate change and phase out fossil fuel subsidies. Beyond statements, private investors are already taking steps to address environmental challenges. Outflow of investments from the fossil fuel sector was indeed one of the most significant points discussed during COP24, when it has been confirmed that the number of public and private institutions, including a significant number of banks, vowed to divest from oil, gas and coal, surpassed 1000 in the ‘Fossil Free’ initiative led by 350.org. It is estimated that the total sum of money withdrawn from the fossil fuel-related industry since the campaign began in 2012 is now approaching USD 8 trillion. COP24 confirmed that progress is being made to push climate finance forward. A shift in thinking and rapid action is still needed to close the gap between the actions which are already being taken and what is needed to mitigate the climate change and its effects. Financial institutions will play an increasingly important role in this transition, as confirmed by the investor’s pledges discussed above. Such declarations give a beneficial context for implementation of initiatives based on private capital accessibility, such as the already mentioned EuroPACE project that CASE and its partners are developing across the continent. At the same time, in the following years, the list of institutions refusing to finance coal-fired power plants in Europe will likely significantly increase, and banks will be joined by insurance and reinsurance companies moving away from insuring mining or coal-based energy generation. Allianz, for instance, already plans to withdraw immediately from insuring single coal-fired power plants. Coal-oriented industry will have to look for financing outside Europe, e.g. in the USA, after the country decided to opt out from the ambitious Paris Agreement. Nevertheless, this can make the process of securing funds much more complicated and longer. The current plan of the Polish government to construct the Ostrołęka C Power Plant with a capacity of 1000 MW by 2023 worth roughly PLN 6.023 billion, instead of investing more in renewable sources like offshore windfarms, can thus be considered not only ecologically questionable but also financially challenging.